Here are three residential properties on the Bench. The Bench has different soil types but tends to be loamy. There are also challenging areas of caliche/hardpan. Creating berms is an easy way to improve drainage around plants. After removing the lawn, we added some berms and ornamental stone, making sure to have enough pathways through the garden to help with weeding and additional planting. As plants were going in, we had to create a border with the neighbor's lawn to keep grass from creeping in (notice edging in bottom right corner). Grown in very nicely. Water once every three weeks. 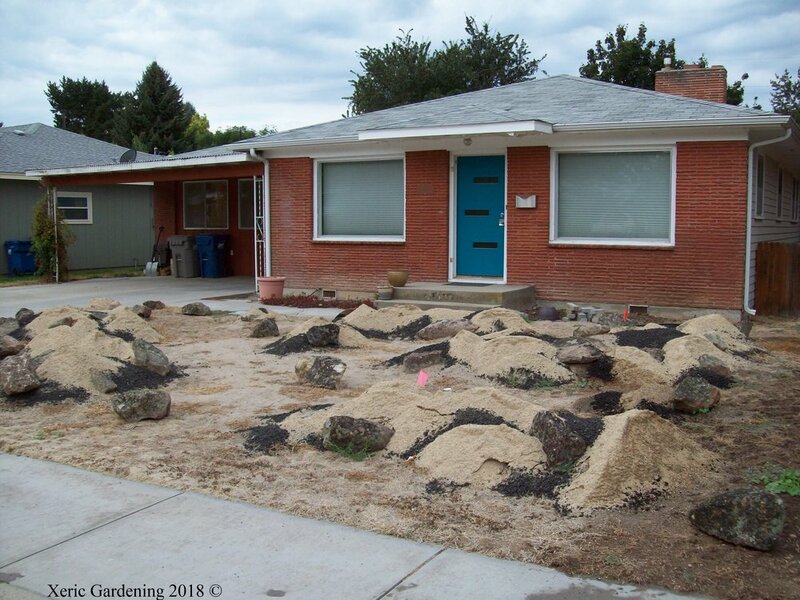 Over the lawn that the homeowners removed, we added berms of a topsoil mix, drip lines, and plants, such as fringed sage, fleabane, Texas red yucca, and sagebrush. Budget allowed for ornamental stone. Additional plants that weren't available the first year were planted, such as a bristlecone, dusty maiden, blazing star, and mules ears. This landscape filled in so beautifully that it was part of the 2017 Idaho Botanical Garden Tour. Drip lines will be removed at the beginning of the fourth year, since this garden should flourish with just the rainfall we get in this area. This was the backyard of a newly constructed home. For the first year, we simply put down cardboard and a heavy layer of mulch to keep the weeds at bay until the clients could budget the money for this project. Their idea was to create a mini-forest in this area, which would be difficult to do here xerically. However, we changed up the forest to be a bristlecone and pinon pine forest, which will have much lower water needs. Trees were planted in the fall. 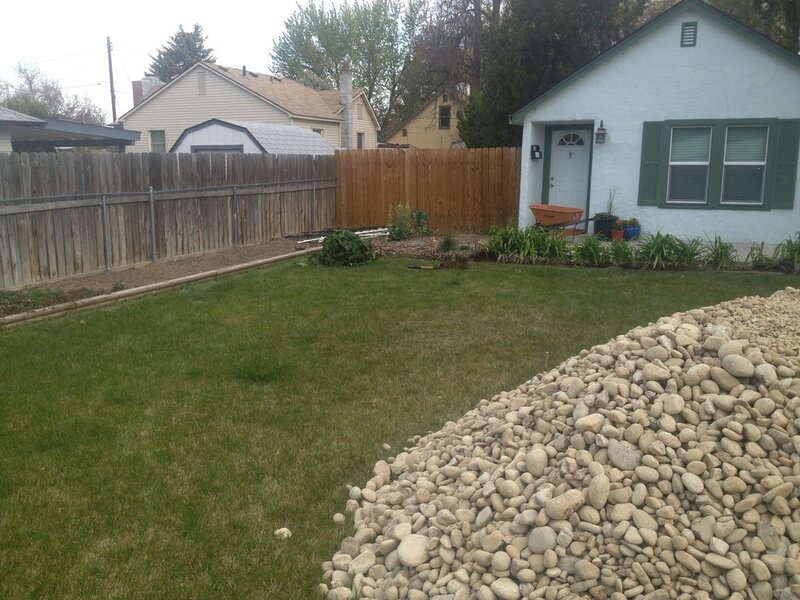 The client's budget allowed for some hardscaping and contouring. 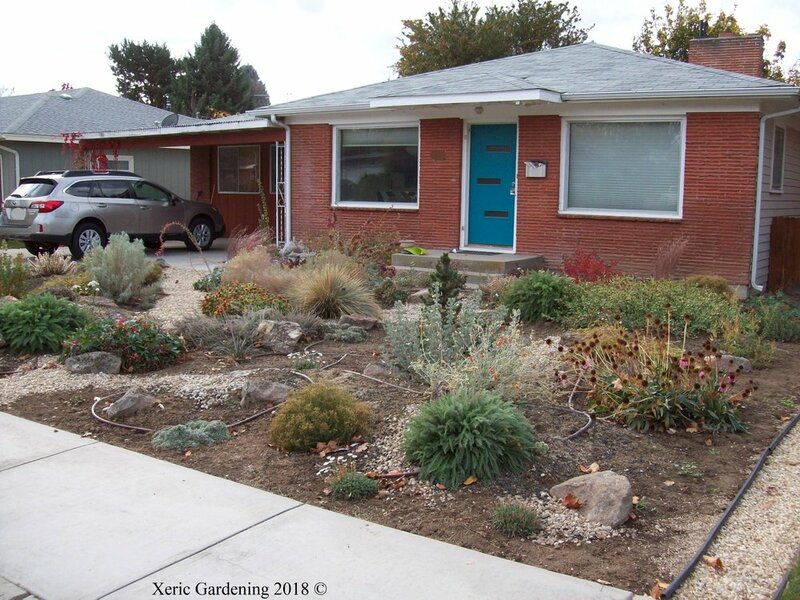 Drip line was added along with many perennials and shrubs, such as buckwheats, evening primrose, Palmer penstemon, mirabilis, golden currant, fernbush, smoke bush, and rabbitbrush. The last year of hardscaping with pathways was completed. Trees, shrubs, and perennials filling in. Watering starts in mid-May and is once every three weeks.